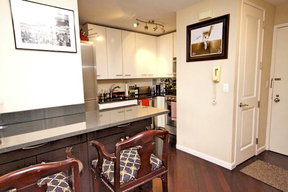 35Q Huge 1 bedroom with 2 bathrooms Light floods through the South facing bay windows of this huge one bedroom, two full baths home offering stunning views of all of Lower Manhattan including the Freedom Tower and Empire State Building! The open kitchen has granite countertops, a breakfast bar, and stainless appliances. The king size bedroom with an en-suite bath and private balcony includes the added bonus of a massive walk-in closet. Beautifully renovated with solid cherry floors throughout this residence has it all! THE CORINTHIAN Features the finest amenities and white glove services. Striking exterior of rounded columns banded with brick and glass. Private, curved drive-through, lavishly planted, three quarter acre plaza with reflecting pool leads to the majestic canopied entrance. The amazing lobby of rich woods, imported marble and fine works of art. Full-service white glove 24-hour doorman and concierge service. Newly renovated full floor amenities which include a children's playroom with their own terrace, An adults lounge with pool table and their own private terrace, a party room complete with an open kitchen,a golf simulator, a 17,000 square foot private health club and spa, a 56 foot glass enclosed year-round pool, a private, landscaped outdoor jogging track add to the convenience of this luxury building. On-site, fully attended 24 hour garage service and valet services also available. Pets allowed.